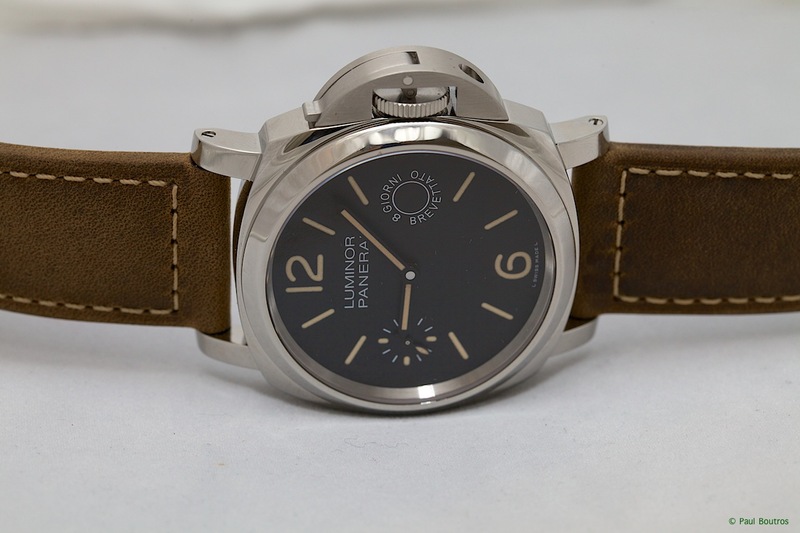 Thanks to the Panerai North America team, I was able to take photos of a selection of this year's new introductions during my short, 30-minute SIHH appointment last week. 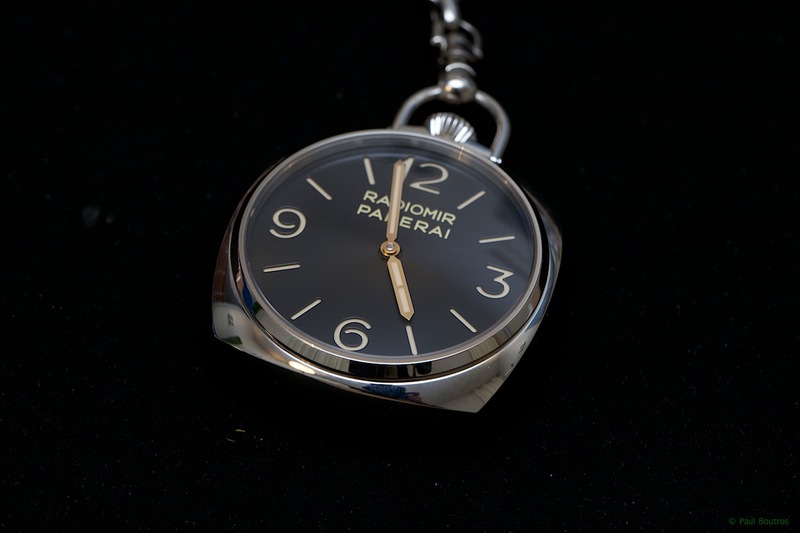 All timepieces were in huge demand, which means I wasn't able to see/photograph all of the novelties, unfortunately. 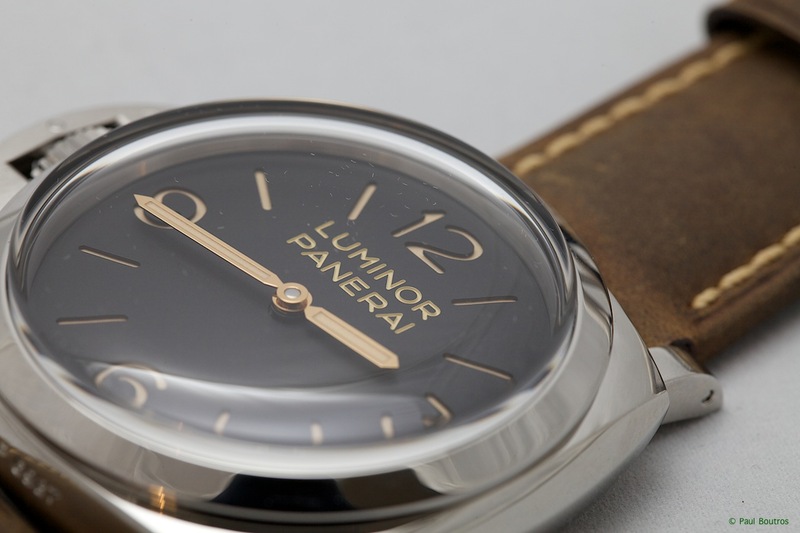 Housed in a Radiomir 1940-style case measuring 45 mm in diameter, three case metals are available - the PAM 518 in platinum (limited edition of 50), PAM 519 in rose gold, and PAM 520 in white gold. 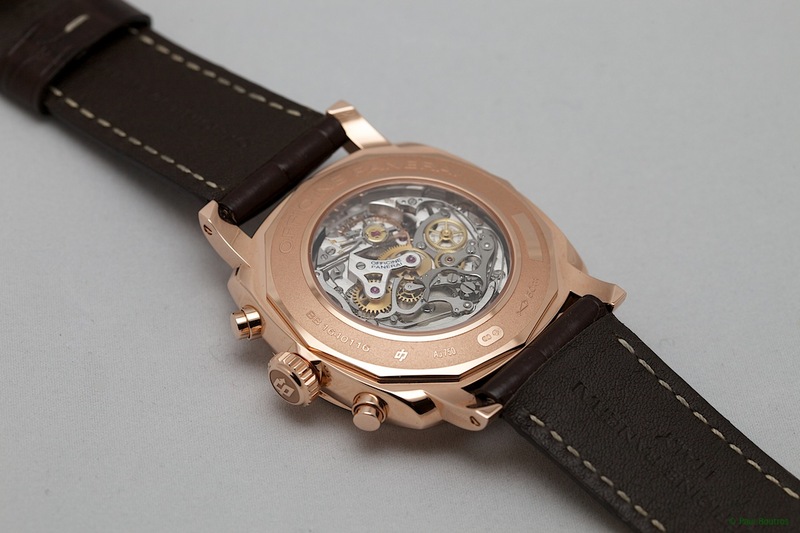 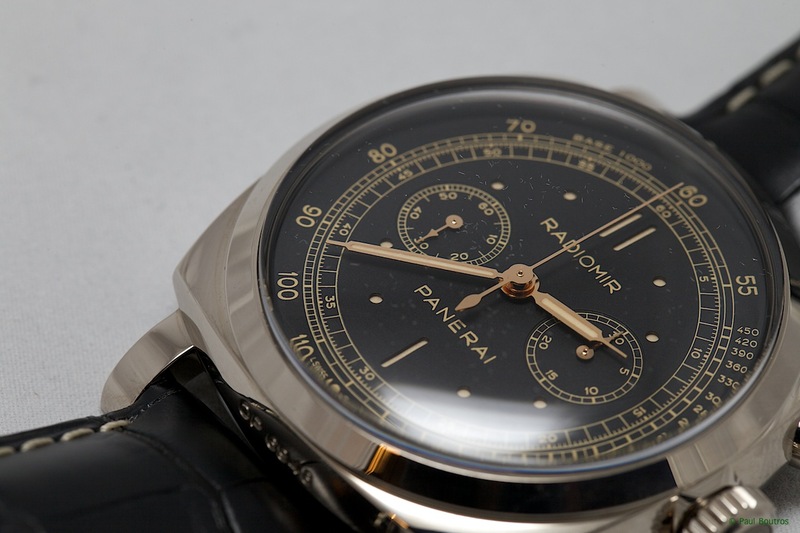 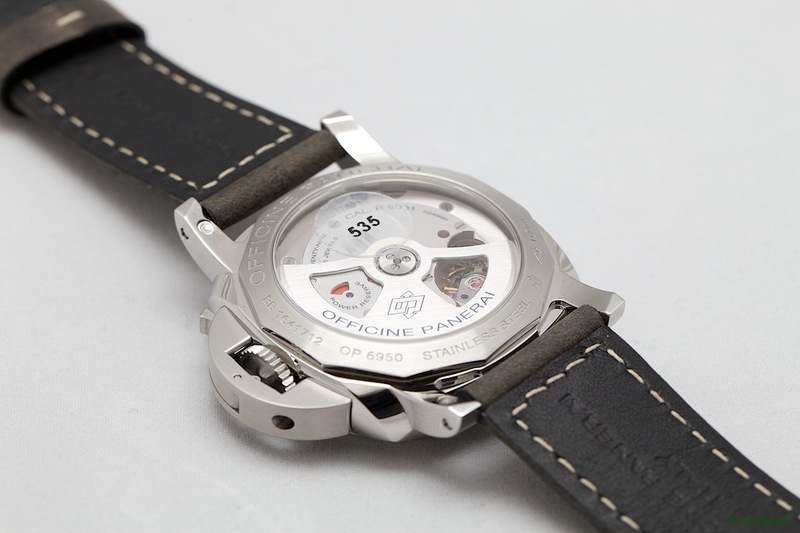 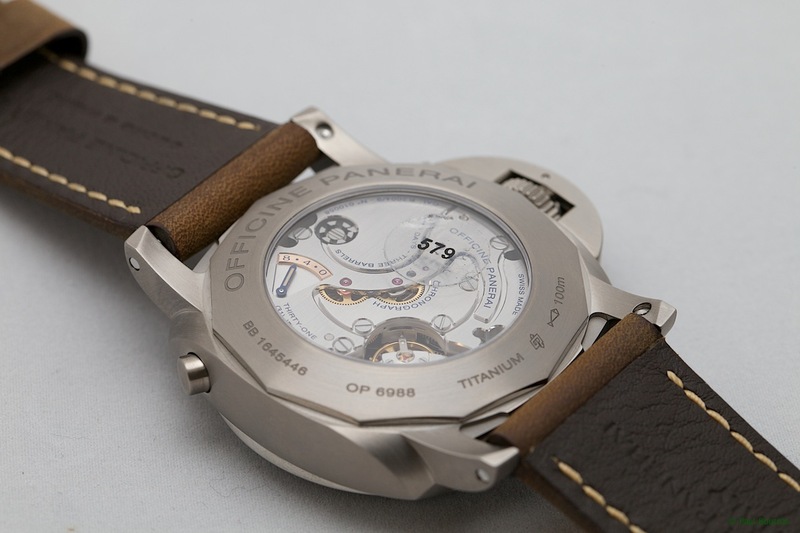 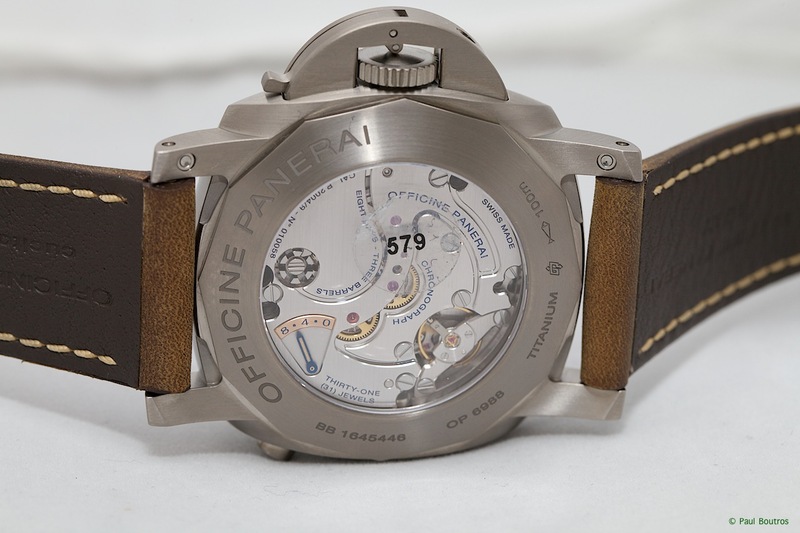 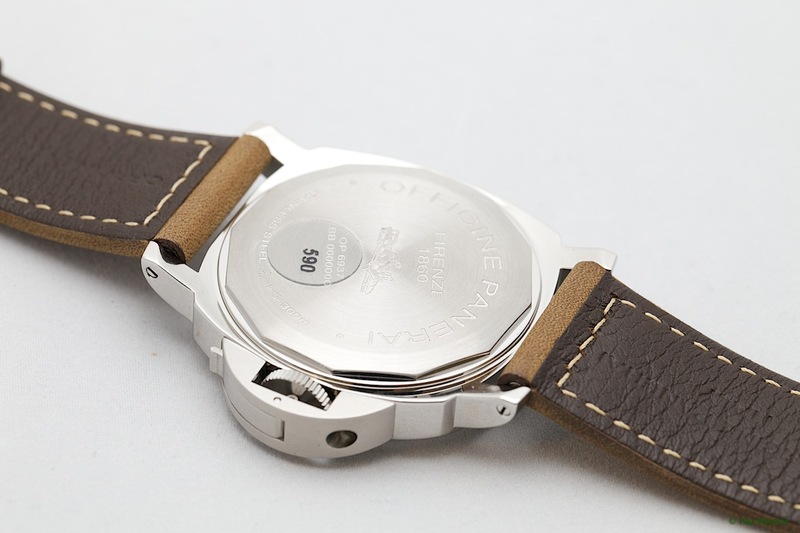 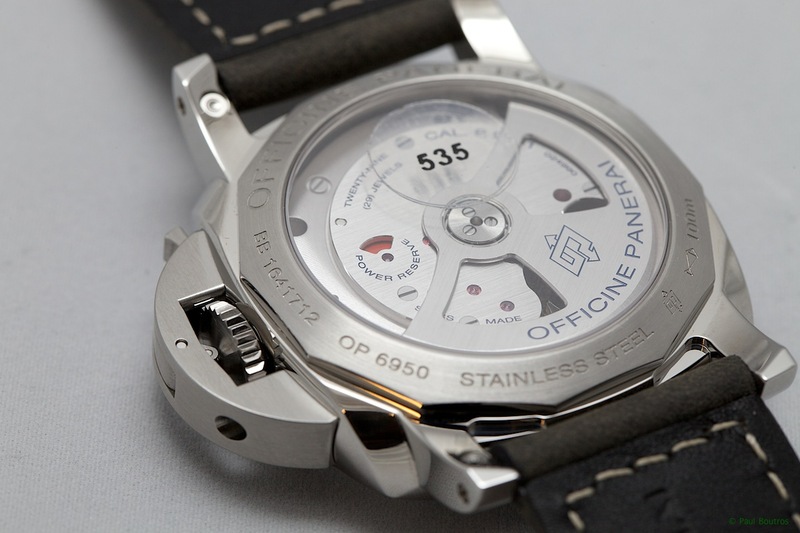 Inside is the Panerai OP XXV chronograph caliber, based on the Minerva caliber 13-22. 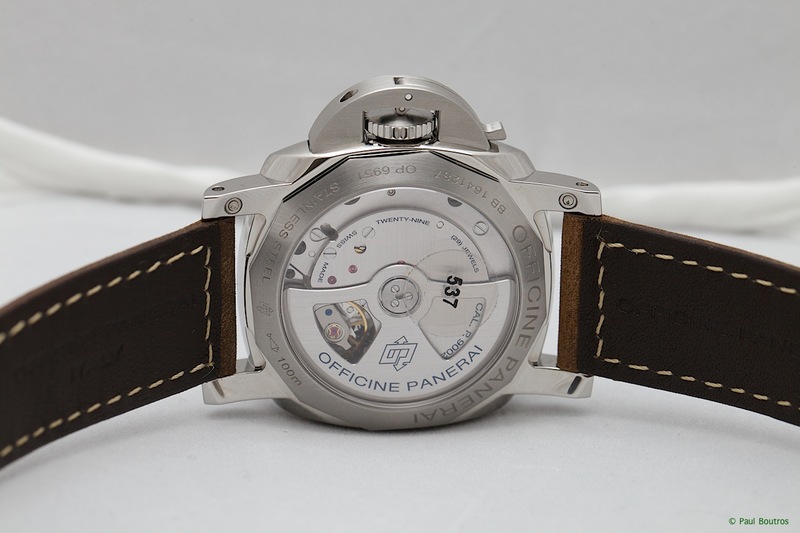 A manual-winding movement, it provides 55 hours of power reserve with its leisurely oscillation rate of 18,000 beats per hour. 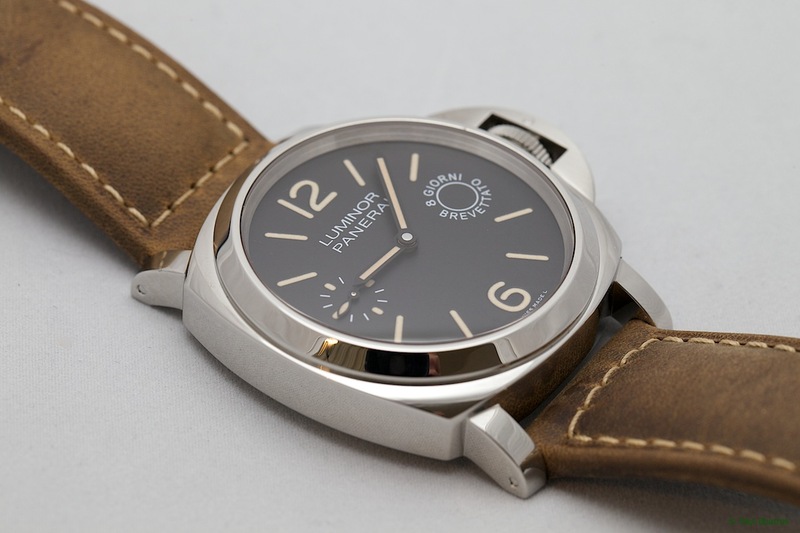 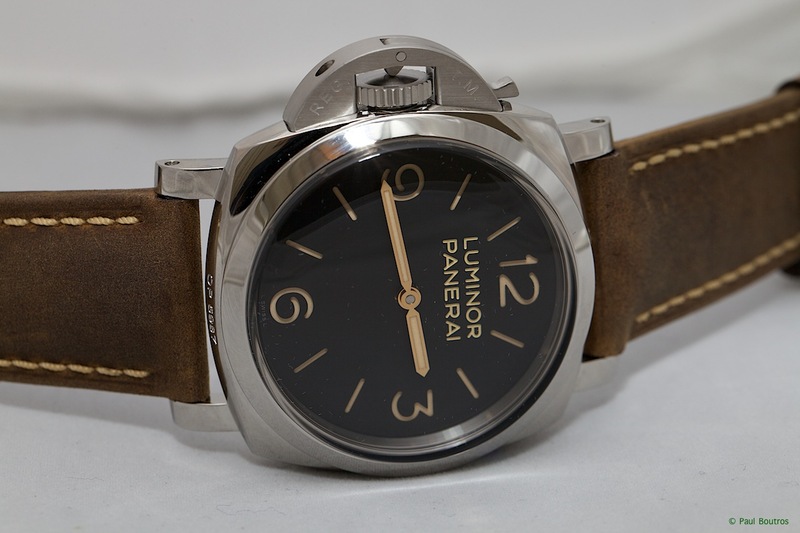 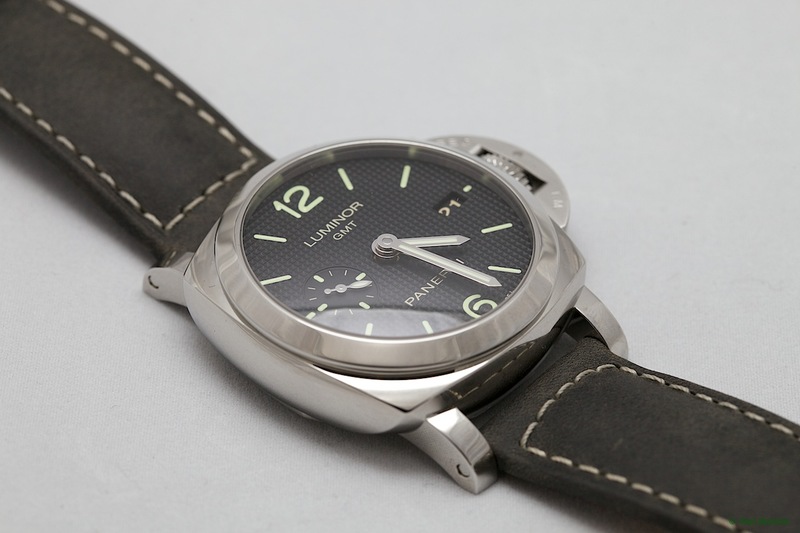 In stainless steel, this 47 mm PAM 557 houses the in-house Panerai caliber P.3000 with 3 days of power reserve. 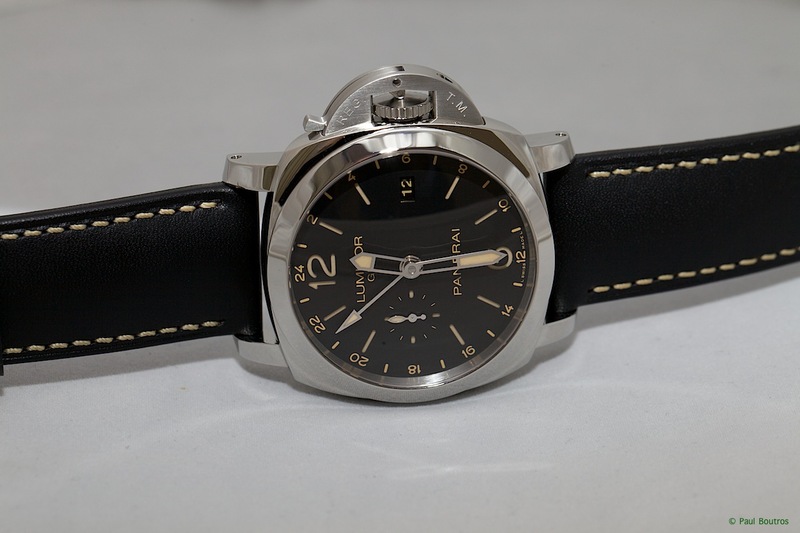 In titanium, this PAM 579 is fitted with the in-house Panerai caliber P.2004/9 - a manual winding, single-button, integrated column-wheel chronograph with stop-seconds (hacking) function. 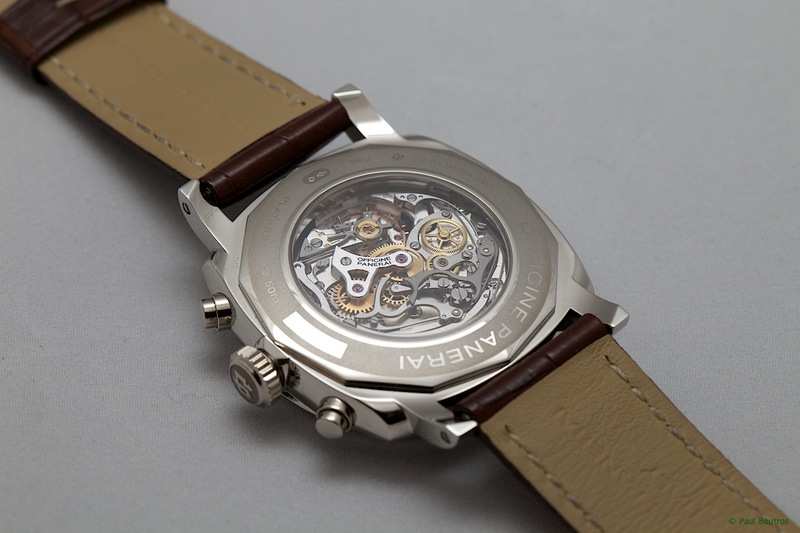 It provides 8 days of power reserve via three mainspring barrels, with a power reserve indicator integrated into the movement's top plate. 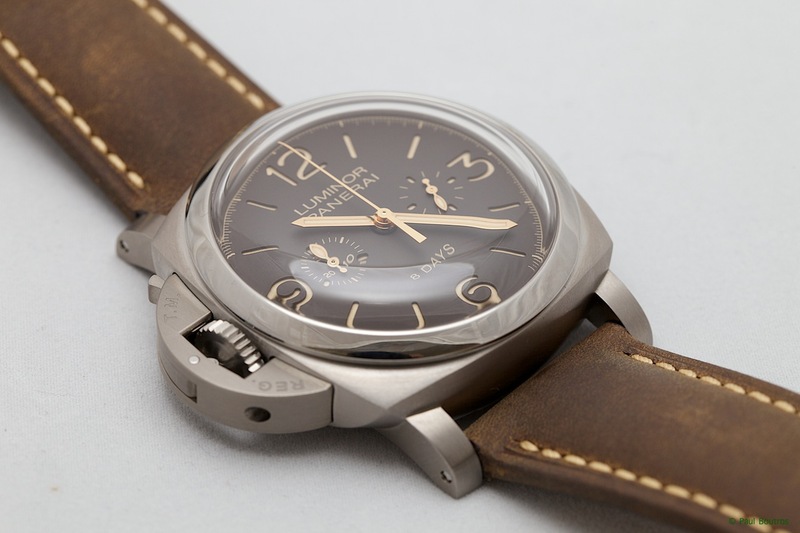 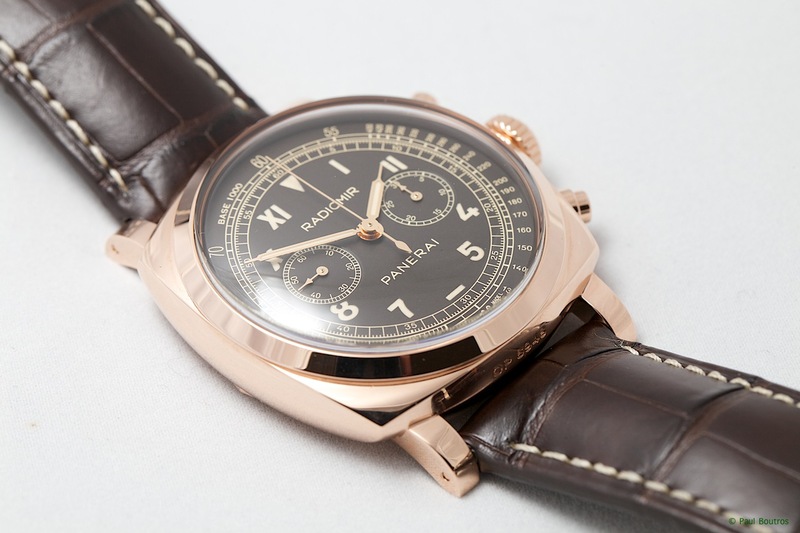 The brown-colored dial and luminous markers give it a vintage look. 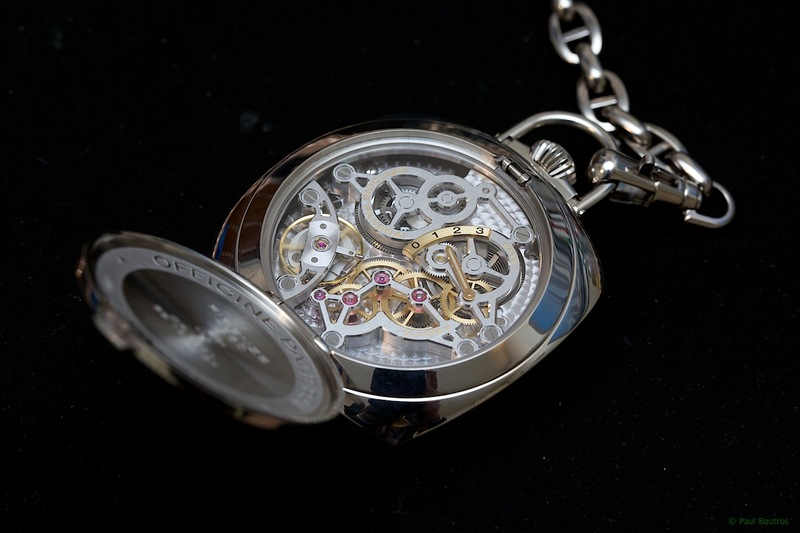 Two new pocket watches in 18 karat white and rose gold, each in a limited edition of 50, feature a spectacular skeletonized Panerai caliber P.3001/10 movement. 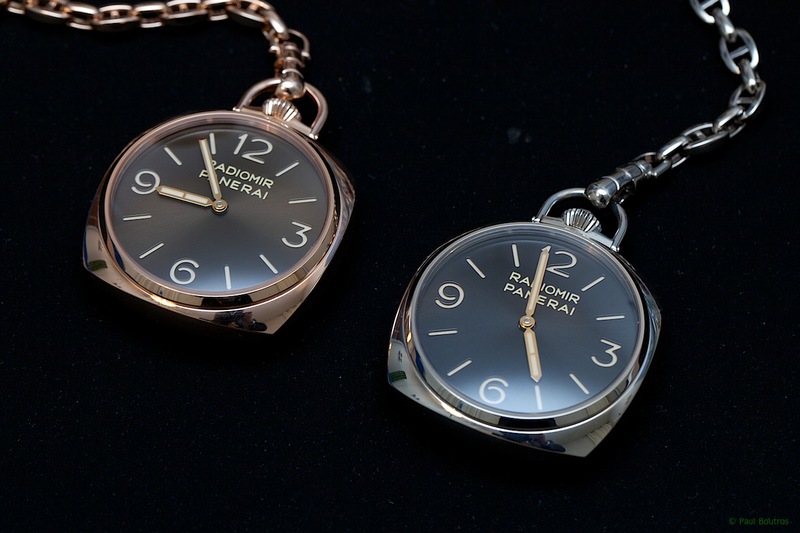 They measure 50 mm in diameter and come with matching gold watch chains. 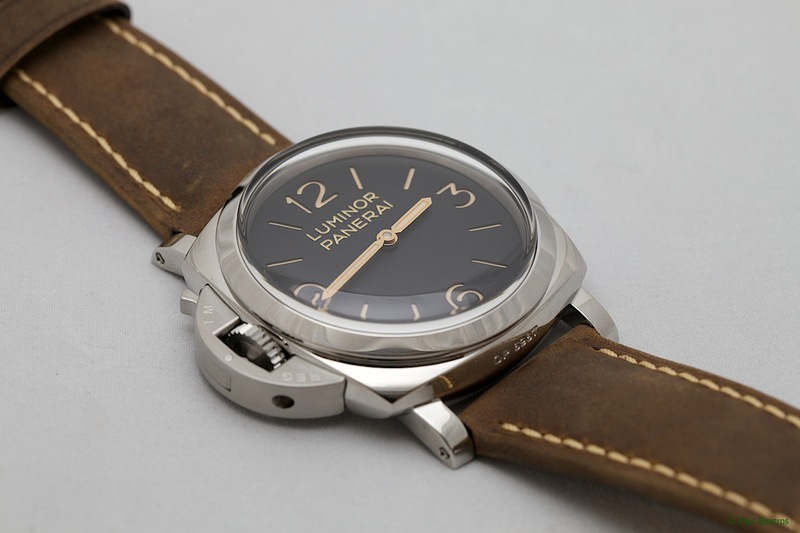 This self-winding PAM 535 features a three day power reserve, date, and GMT complication. 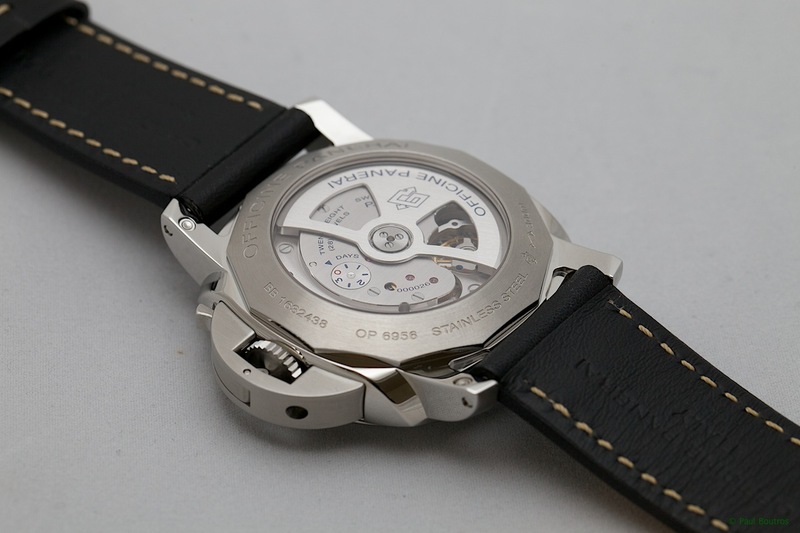 The power reserve indicator is integrated into the cal. 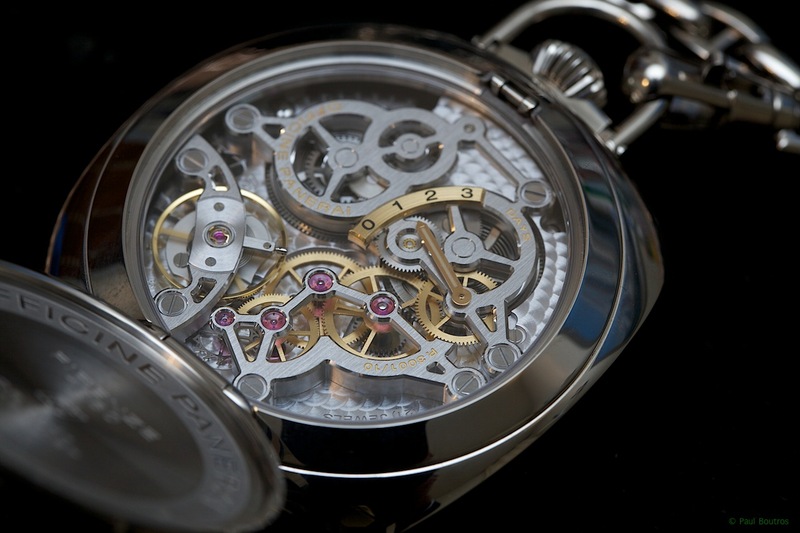 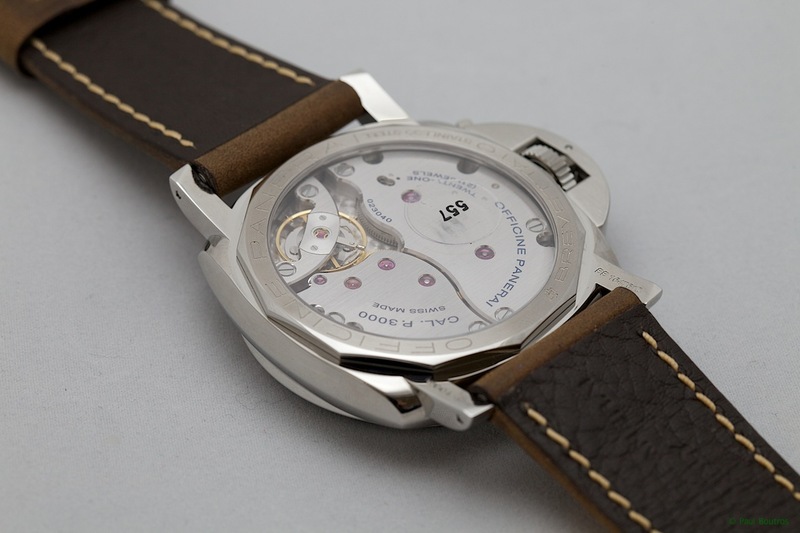 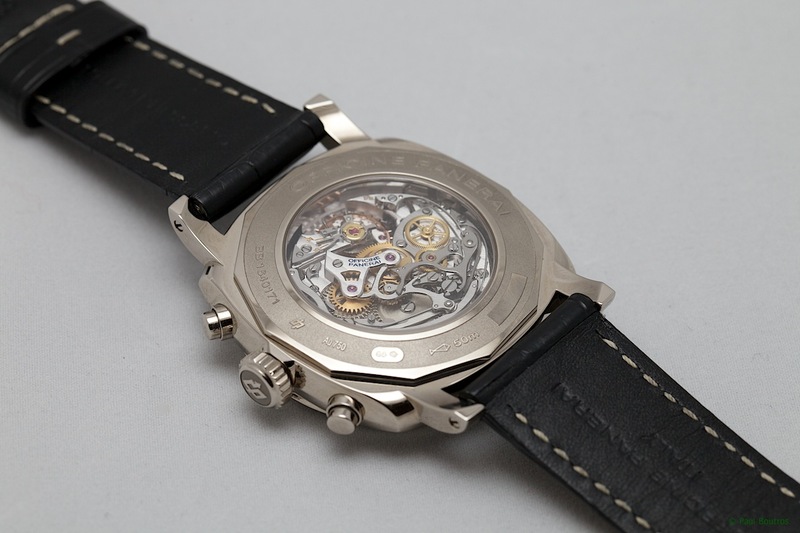 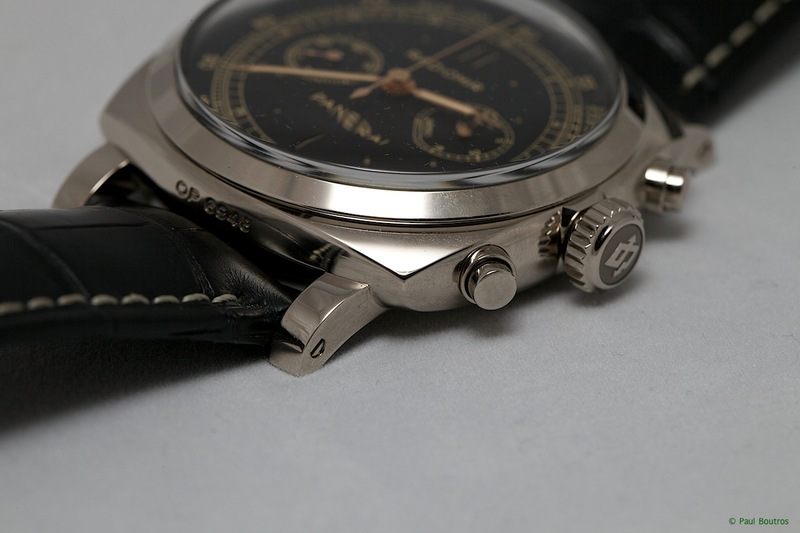 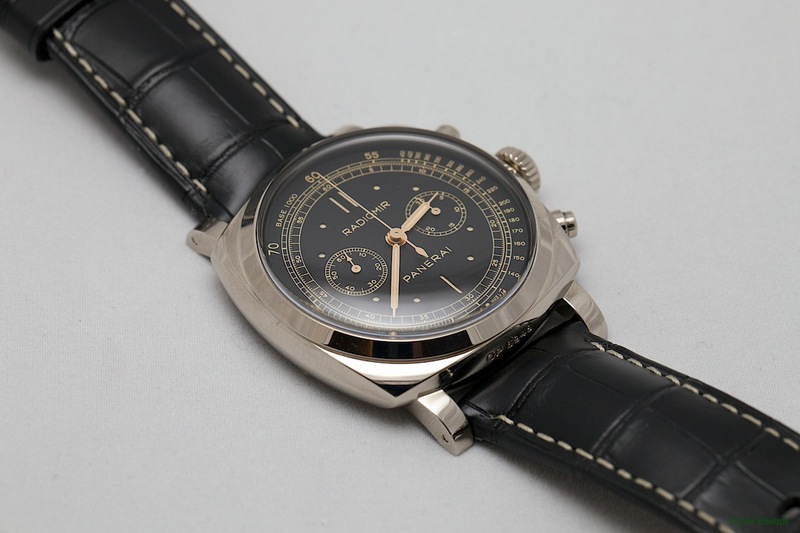 P.9001 movement, visible through an aperture. 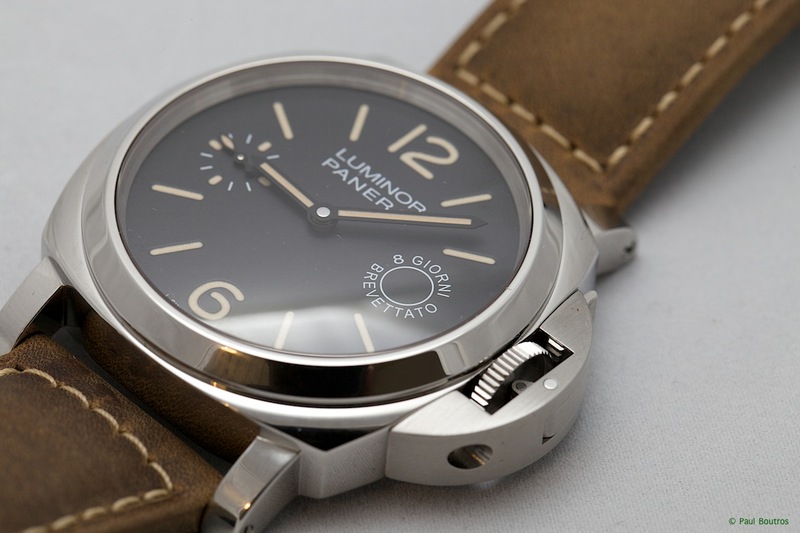 The PAM 531 includes a 24-hour indicator along the outer circumference of the dial. 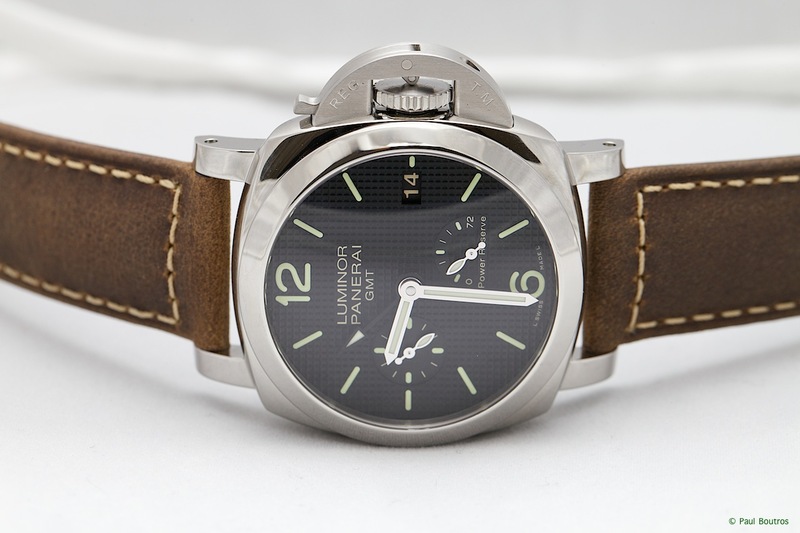 Slightly different than the PAM 535 above, the PAM 537 incorporates the power reserve indicator on the dial. 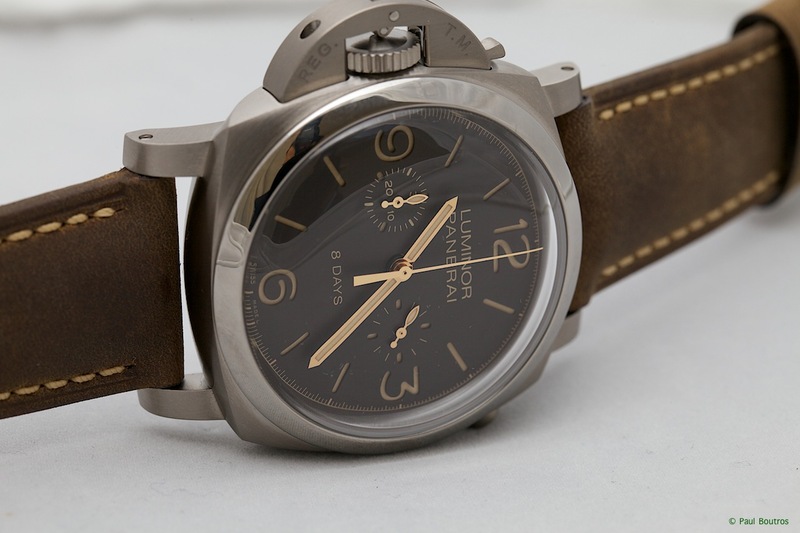 My thanks to Panerai's Michele Gallagher and Kelly Gaussa of Panerai North America, for their great help in allowing me to take these photos. 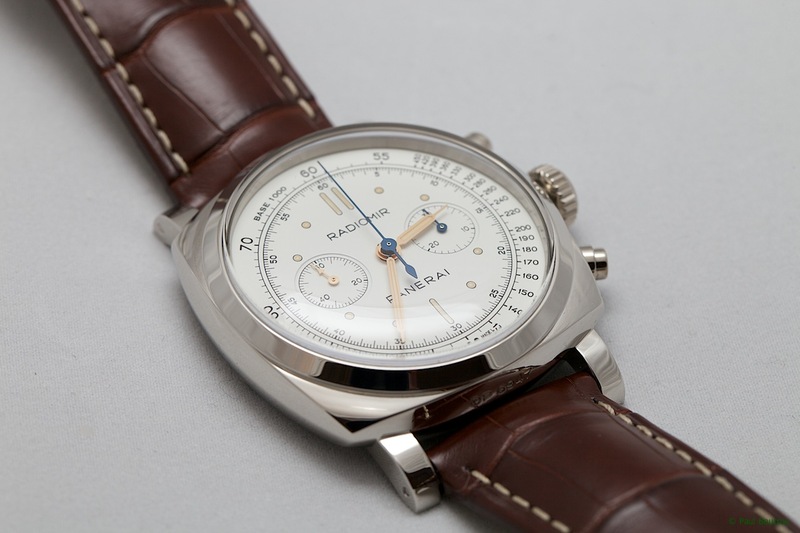 Previous Topic: Is there a Stainless Version of 351?